This possession game not only gets the ball moving quickly, it encourages quick combination play to score goals. In order to score the player in possession must play a pass through a set of triangle cones and receive a 1-touch pass back through the cones in order to score. 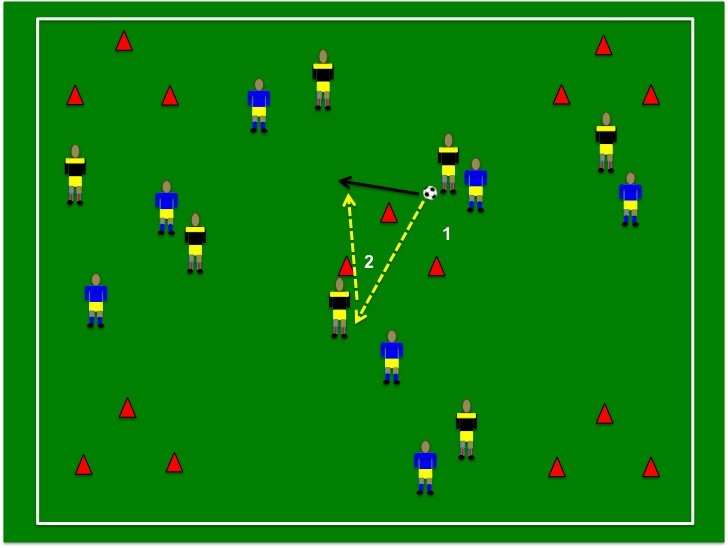 In this example you can see the player in yellow and black passes the ball through the center triangle cones and gets a 1-time pass back through the cones for a point. The team will circulate the ball quickly looking to attack any triangle cone set-up that is left open. Feel free to play 4v4+1, 5v5, 6v6 etc. I recommend starting with a 2 touch and 1-touch scoring. Players will enjoy this exercise as it gets competitive quickly. Next Post Train Like Dortmund. Play Like Dortmund.